(Nanowerk News) The University of Glasgow is playing a key role in a €26M (£23m) European project called MODERN looking at how to design the next generation computer chips – using variable and unreliable nanotransistors. Transistors are the tiny on-off switches which are the building blocks of all electronic circuits and computer chips and have been steadily decreasing in size for the past 50 years. However, the smaller transistors become, the more atomic-scale variations in their size and structure affect their performance and thus the reliability of a whole circuit. This increased variability is a problem which presents a huge barrier to the continued scaling of microchips and the development of ever-more powerful computers and electronic systems. Currently the lead semiconductor manufacturer is producing microchips with transistors less than 30 nanometres in size – by comparison a human hair is around 100,000 nanometres wide – but future transistors will have to be even smaller if computers are to continue to increase in power. 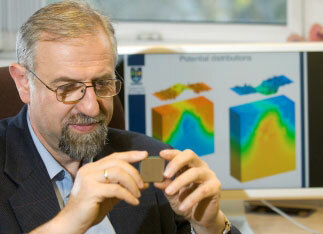 Professor Asen Asenov, a device modelling expert in Electronics and Electrical Engineering and the leading world authority in statistical complementary metal-oxide semiconductor variability, is leading Glasgow's involvement in the project which is worth £1.5m to the University and comprises 28 European partners. The MODERN team was assembled in response to a funding call by the European Nanoelectronics Initiative Advisory Council (ENIAC). Support for Glasgow's involvement was made possible thanks to special funding package from the Engineering and Physical Sciences Research Council (ESPRC) and Scottish Enterprise. In the MODERN consortium the University of Glasgow is providing key expertise in the physical simulation of statistical variability and reliability, statistical compact model extraction and statistical circuit simulation. The simulations will be conducted using leading edge variability simulation tools developed in the Glasgow Device Modelling Group over the last 10 years and will involve a recently established spin-out company called Gold Standard Simulation which will be providing services to the MODERN project. Prof Asenov said: "We invested heavily in variability research and in the development of variability simulation tools at a time when the industry was not fully aware of the gravity of the forthcoming variability problem. Now we are in the position to make significant contribution in tackling the variability challenge". David Jack, Project manager at Scottish Enterprise, said: "This project will reinforce the University of Glasgow's position at the forefront of technology which will be built into many new electronic products. The formation of spin-out company, Gold Standard Simulations Ltd, demonstrates that Scotland's growing businesses have a strong opportunity to lead the electronics industry of the future." EPSRC Chief Executive, Dave Delpy, said: "Working with Scottish Enterprise we are delighted to have enabled the UK to participate in this ambitious and potentially high impact project. This collaboration is an excellent example of the union of world leading research and a delivery partner that can provide powerful economic impact and accelerates our path to prosperity."